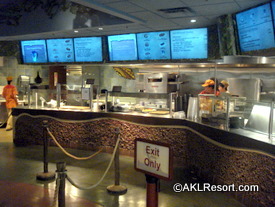 Named after the Masai Mara National Reserve in Africa, this quick service restaurant located in Disney’s Animal Kingdom Lodge is sure to please all appetites with a taste of Africa, as well as American favorites. Mara is open for breakfast, lunch, and dinner and is located next to the resort’s Uzima Springs pool area. Guests can dine indoors or take their meals poolside. There is a “Grab & Go” market area that features snacks, desserts, bottled drinks, breakfast items, and fruit. Hot breakfast items are served starting at 7:00 am. For lunch and dinner, the Mara features an ample selection of African and American entrees; soups, salads, flatbreads, a rotisserie chicken platter, fried shrimp, and falafels are highlighted. Cookies, a Paw Print Brownie, and cheesecake are available for dessert. A children’s menu featuring rotisserie chicken, macaroni & cheese, hot dogs, or chicken fingers is also available. In the indoor dining area, a condiment bar is close to the self-serve drink station. There is a small television towards the back of the seating area to entertain guests while eating. Mara also features a selection of African and international wines, beers, cocktails, and even choose-your-own-flavor smoothies. American standards like rotisserie chicken, flatbread pizzas, chicken strips, hamburgers, and fried shrimp. More exotic entrees include African stew, a falafel pita, and chicken pepper pot soup. Continental breakfast items, snacks, desserts, fruit, salads, and bottled drinks are available in the “Grab & Go” market section. Waffles, breakfast platters, and breakfast wraps are available as early as 7:00 am. Purchase your refillable mug here. Don’t forget to try the Zebra Domes, one of Animal Kingdom Lodge’s most famous desserts. They are usually available, pre-boxed, in the Mara refrigerated section.